Questions of how we are Jewish and, more critically, how and why we are not have been churning within the Western imagination throughout its history. 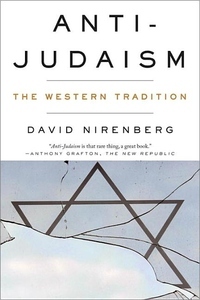 Ancient Egyptians, Greeks, and Romans; Christians and Muslims of every period; even the secularists of modernity have used Judaism in constructing their visions of the world. The thrust of this tradition construes Judaism as an opposition, a danger often from within, to be criticized, attacked, and eliminated. The intersections of these ideas with the world of power--the Roman destruction of the Second Temple, the Spanish Inquisition, the German Holocaust--are well known. The ways of thought underlying these tragedies can be found at the very foundation of Western history.